A best practice consideration is to adopt a combination of traditional and managed cap programming models. Reviewing the basic features and benefits of traditional and self-service relocation program models can help companies understand which programming model is the right choice for their unique requirements. What is a Traditional Relocation Model? A robust pre-decision process is one of the most important things that contribute to high satisfaction rates among relocating employees. Recognizing its importance to overall satisfaction, there has been a significant increase in pre-decision service usage within the healthcare industry. Additionally, 84% to 90% of healthcare companies utilize a tiered policy approach to relocation. The most common are by position level or homeowner versus renter status. Providing additional benefits in a relocation program to attract highly skilled new hires will give a healthcare company a competitive advantage. For example, home selling and buying assistance might be a very attractive benefit for a talented healthcare professional who is considering a relocation offer from a prospective employer. Levels of assistance in this area can vary based on position. A relocation policy with a strong communication plan will clearly define and describe the exceptional value that this benefit provides to new hires. What are Self-Service Relocation Program Models? 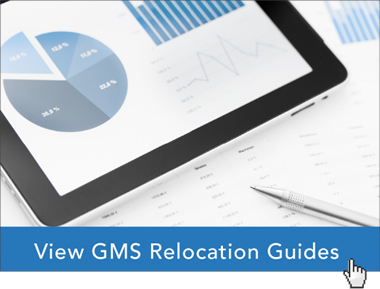 Self-service relocation models include lump sum and managed cap programs. The point is that employees direct their own relocation process. The difference between lump sum and managed cap programs is whether the employee or the RMC manages the relocation process. In a lump sum program, companies provide employees with an allocated lump sum payment and let the employee choose their relocation providers and process. Some Relocation Management Companies (RMCs) offer programs such as a dedicated debit card where funds are electronically transferred to the employee after their expense report is audited. The employee has immediate access 24/7/365 via ATMs and point-of sale retailers nationwide. In addition, funds can also be electronically transferred from the card to their personal checking account. The success of a lump sum program rests upon the relocating employee, without the benefit of expert guidance and counseling that an RMC can provide. In a managed cap program, companies provide employees a specific amount of funds to spend. Employees benefit from the support services offered by the RMC, including policy counseling to the employee on the best allocation of their funds when choosing from an array of relocation services. In addition, they receive guidance on the taxation of particular components, saving the company a FICA tax match and gross-up on particular benefits, such as the household goods shipment and final move trip. A managed cap program contributes to fewer budget overages and higher satisfaction levels than the lump-sum option, maximizing the benefit for both the company and the employee. Consider tiered policies by level, under a managed cap methodology. This will inherently produce greater efficiencies than other relocation program models, provide employees choice, enhance quality, and contain costs. According to Healthcare Source’s Healthcare Talent Management Trends for 2018, healthcare companies increasingly face skilled labor shortages in several employment fields. The aging population leads to increasing demand for healthcare talent, while the number of retiring healthcare professionals leads to a declining talent pool, creating a gap. Traditional employment recruiting strategies are not effective in closing the talent gap. Healthcare companies can attract employees by offering relocation programs with attractive benefits. Most healthcare companies report a willingness to pay for relocation. In order to get the best results from their talent recruiting efforts, healthcare companies should promote their relocation program as a highly valuable benefit. This will help the company attract and retain talent that is looking for assignments in new locations. Communicating their interest in attracting new hires and their willingness to help employees during their relocation process helps strengthen and broaden a healthcare company’s employer branding efforts. Many healthcare companies are investing significantly in building their employer brands to attract and engage top quality talent. A well-defined and attractive relocation program that follows industry best practices tells prospective employees the company is an employer of choice within the industry. Healthcare talent acquisition programs must attract a variety of new hires, with many different skill levels. Offering a combination of traditional and managed cap programming models, along with a tiered policy approach, provides healthcare companies with a wide range of options to attract new hires. Global Mobility Solutions’ team of corporate relocation experts have helped thousands of our clients develop relocation program models that attract and retain qualified employees. Our team can help your healthcare company by using industry best practices to design a relocation program that combines traditional and managed cap models within a tiered policy to provide the widest range of options, increasing your company’s ability to attract and retain new employees.